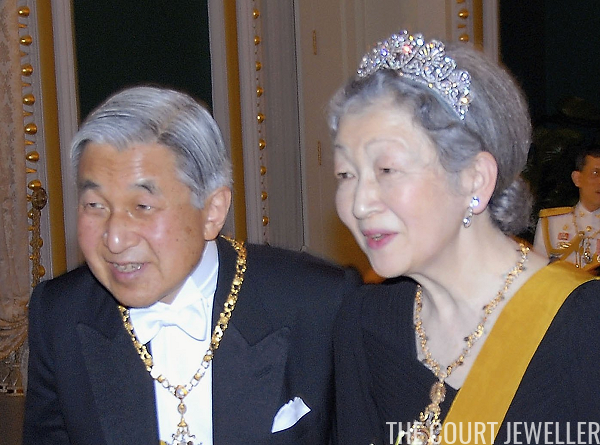 To wrap up our month-long celebration of the tiaras worn by the imperial ladies of Japan, we've got one of my personal favorites: the family's diamond honeysuckle tiara. The tiara has been in the family for at least two generations. Its first documented wearer was Setsuko Matsudaira, the English-born wife of Yasuhito, Prince Chichibu. Setsuko was the daughter of the Japanese ambassador to the United States and Great Britain, and she had major family ties to Japan's pre-war aristocracy. 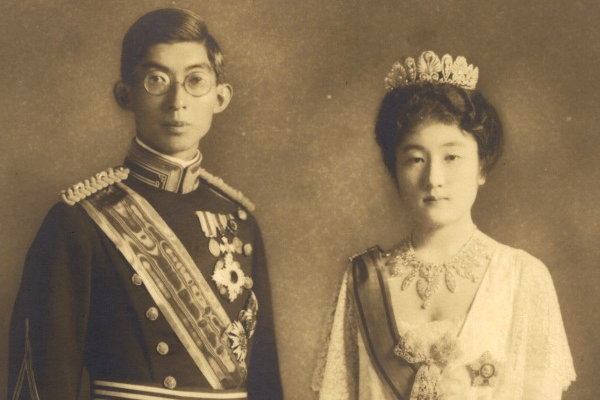 When she married Yasuhito, the second son of Emperor Yoshihito, brother of Emperor Hirohito, and uncle of Emperor Akihito, in 1928, Setsuko wore the honeysuckle tiara and a coordinating diamond necklace for part of the wedding ceremonies. They represented the imperial family at numerous important occasions, including the 1937 coronation in Britain. The Prince and Princess Chichibu had no children, so after her death in 1995, her jewels were returned to the imperial vaults. 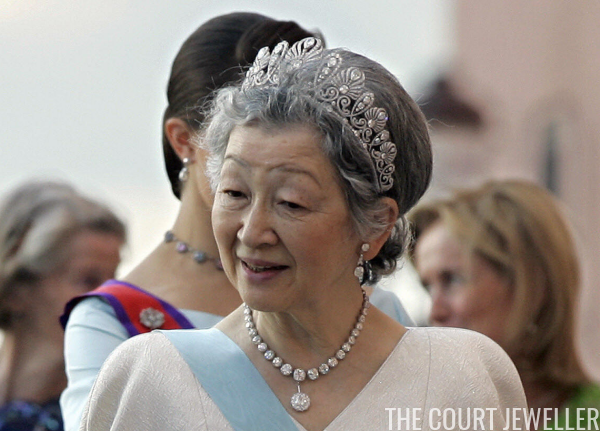 The tiara reappeared about a decade later on her nephew's wife, Empress Michiko. She wore the tiara in a more open style, which suggests that it has an adjustable frame. 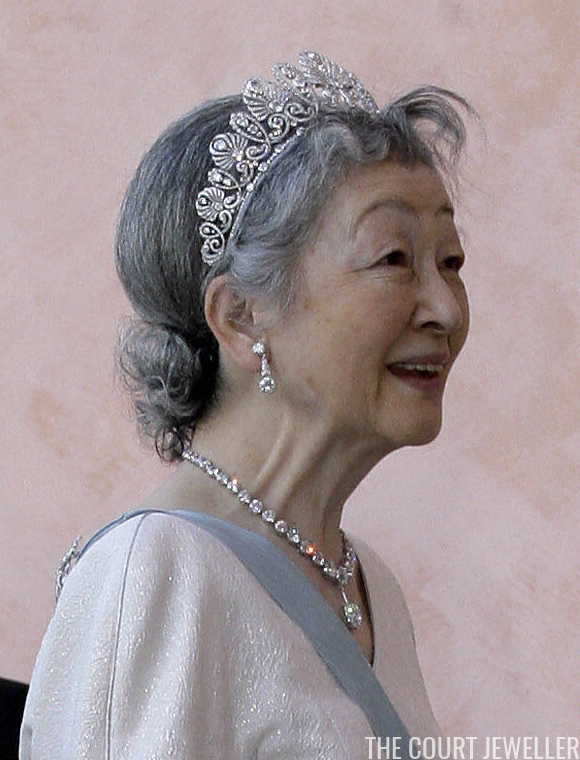 Michiko began favoring the honeysuckle tiara after she developed back and neck issues that made heavier tiaras painful to wear. Above, she wears the tiara during the Diamond Jubilee of King Bhumibol Adulyadej of Thailand in June 2006. And above, she wears the tiara (with a slight hair malfunction) during a visit to Sweden in May 2007. 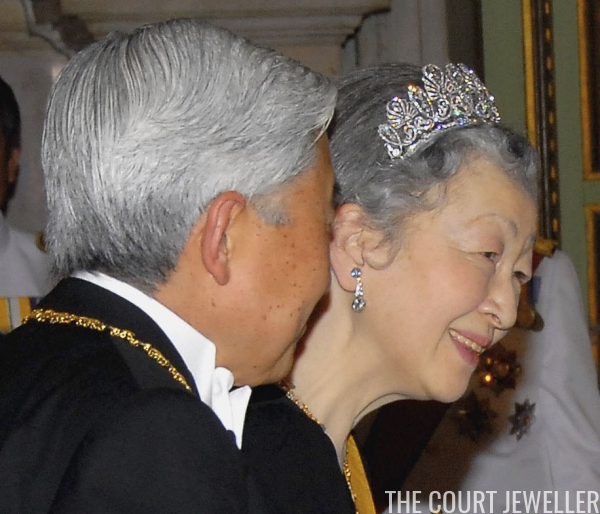 Michiko has stopped wearing tiaras altogether now, unfortunately, but it's heartening to see jewels being reused and recycled in the family. It's becoming more and more clear to me that Japan's Imperial Household Agency runs a de facto jewelry foundation, which clearly includes jewels that are no longer worn because of the deaths or marriages of their previous wearers. (The IHA, of course, won't be commenting on that either way.) I'm hopeful that we'll continue to see many of these jewels reappear on other women of the imperial family in the years to come.